Engagement rings are the first symbol to signify to your mate that you are both just one step closer to sharing the rest of your lives together. Therefore, it is extremely important for the engagement ring to be exactly perfect. With so many choices of engagement rings on the market, step away from the mainstream and show your love by presenting her with a luxurious diamond engagement ring. Take her breathe away and splurge on a fancy colored diamond engagement ring, perhaps a beautiful and striking yellow canary diamond would be a perfect fit for her. Maybe a stunning five carat white diamond engagement ring would be more her style. 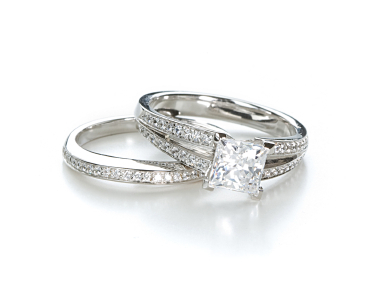 There is a vast selection of engagement rings to choose from. However, before investing your time and money, there are quite a few pieces of information that you should keep in mind when shopping for a luxurious diamond engagement ring. This information is known as the 4 “C’s” of the Diamond Grading System: color, cut, clarity, and carat. There is a color rating scale in place to make diamond buyers aware of the value and quality the diamond possesses. Typically, jewelers rate diamonds using the letters D through Z. A diamond that has a “D” rating is considered to be colorless and therefore is extremely expensive. On the other hand a diamond that has a “Z” rating is considered to be of poor quality due to its light-yellow or brownish appearance. Usually, when diamonds are as close to the colorless rating as possible, the diamonds are considered to be more precious and striking than their tarnished-colored counterparts. Also, when a diamond is high on the color rating scale, the more high-priced the diamond will be as it will be considered almost colorless. By deciding on a white diamond engagement ring, there are many styles and price ranges you will be able to choose from. If you decided to break away from the traditional white diamond engagement ring, you would be limited to a specific selection and not have much flexibility when it comes to style and price. However, there are some wonderful exceptions to having color in diamonds, without the diamond having a “Z” rating on the color scale. There are special colored diamonds, which are considered to be rarer than colorless diamonds are known as fancy colored diamonds. Some amazing diamond colors include: blue, green, yellow and even pink. Since these diamonds are considered to be a rarity within the jewelry industry, they are also priced extremely high. Fancy colored diamonds are priced according how rich the color is, the more vibrant the color is the more valuable the diamond is. Selecting a colored-diamond engagement ring would be ideal for any fiancée who enjoys fashion and likes to set trends. Make sure to select an appropriate color for your fiancée, one that represents her. For example, pinks traditionally represent femininity, while yellow can represent confidence. Colored diamond engagement rings are both luxurious and quite unique and will make an everlasting impression. Many people believe that the cut of the diamond means the shape of the diamond. That belief could not be further from the truth. The cut of a diamond is actually how the jeweler cutter arranges the diamond’s facets and angles in a line in order to bring out the true natural beauty of the diamond. This is quite important an important factor when determining where to cut a diamond. Reason being, in order to make the diamond truly shine, it needs to have light allowed into the stone for it to reflect back out. When this occurs it allows us to see the brilliance of the diamond. Unfortunately, some jewelers will poorly cut a diamond in order to preserve the size of the diamond. Size is not always everything when it comes to diamonds. Having a large carat diamond engagement ring would be wonderful, only if the cut quality would be ranked just as high as the amount of carats in the ring. Poor cuts, that are either too shallow or too deep, sadly cause the light to run out of the bottom or the sides of the diamond, thus reducing the brilliance and value of the diamond. If you are able to select your own diamond for an engagement ring, make sure that it is carefully analyzed and that it will be carefully and precisely cut by a jeweler, to ensure the most brilliance possible. Just like with the color of the diamond, the cut of the diamond is also rated and can fall into one of these grades: ideal, premium, very good, good, fair, and poor. For a more brilliant diamond, you should choose an ideal or premium ranked diamond on the cut scale. No matter the shape of the diamond, if it is well-cut, it will shine and radiate. It is quite important to have the quality of the diamond’s cut evaluated by a professional in the jewelry industry in order to determine that the diamond is cut to its utmost ideal proportions. Since natural diamonds are a product of nature, it goes without saying that most diamonds have some imperfections, such as: air bubbles, mineral deposits, or scratches. For a diamond to be of high value and quality, it should have very few inclusions. When a diamond is cut, some jewelers are able to eliminate and cut away from both external and internal flaws the diamond may have. However, most of these imperfections can not been seen by the naked eye. Only with high magnification can these inclusions be seen. Minor imperfections do not affect how beautiful the diamond is, but the larger the imperfections are, can considerably reduce the brilliance of the diamond. Value and price are drastically reduced with any imperfections the diamond may have, and therefore need to be carefully assessed by a jeweler. As with the previous two “C’s” of the Diamond Grading System, there is also a scale in order to grade a diamond’s clarity. As we have already seen with the other grading systems, diamonds that fall into the top category are the rarest and therefore have the most value. Diamonds that can be categorized into the “F” to “VVS2” clarity scale would be the most luxurious and most expensive as the diamonds have basically zero flaws. The cost of such diamonds can range, because other factors such as color, cut and carat also need to be determined to have an overall cost. However, you can be sure that if the diamond you are selecting for an engagement ring has hardly any blemishes and would be considered internally flawless or even flawless (extremely rare), you’ll be paying a pretty penny. This is the one category of the Diamond Grading System that many people are quite familiar with. A carat is the measurement used in order to determine the size and weight of the diamond. Most engagements are approximately one carat, but that obviously depends on your budget. If you are seeking out a luxurious engagement ring, perhaps 10 or more carats would be ideal. Remember, no matter the carat, the engagement ring should be appropriate for the person you are giving it to. Obviously, the more carats the more expensive the ring will be. If the engagement ring has more than one diamond, the total mass of the diamonds is known as total carat weight. This is an important factor when discussing carat weight with your jeweler. As previously mentioned, the size of the diamond does not always make it the best and brilliant diamond. Only when the cut, color and clarity of the diamond are of the best quality, then the carat of the same diamond will be increased substantially in value. Although, not officially included in the 4 “C’s” of the Diamond Grading System, there is another “C” that should be included and that is cost. Based upon the above four factors essentially will determine how much you will to pay for an engagement ring. If cost is not a factor, Harry Winston offers a beautiful collection of luxurious engagement rings. Their premium diamonds come with a certificate from the Gemological Institute of America (which by the way, you should receive from any jeweler when purchasing a diamond engagement ring). Here, you are able to specifically customize that one-of-a-kind engagement ring for your future bride. Each piece of the ring; from the stone to the metal of the band is carefully hand-crafted in order to showcase the ring its uniqueness. Remember to keep in mind your future fiancée’s current jewelry taste when selecting an engagement ring. If you are unsure, hint around and find out her likes and dislikes are with regards to styles and if she may prefer a fancy colored diamond or the traditional white diamond. By understanding her style, choosing an engagement should be relatively easy. Understanding the four “C’s” of the Diamond Grading System and your fiancée’s style will give the confidence needed to make such an important decision. Above all else, when beginning your search for the perfect luxurious engagement ring, make sure that you are conducting business with a reputable jeweler, as you want to make sure of the high quality of the ring and of the diamond.